I will bid farewell to 2009 today. With more "wintry mix" predicted for tomorrow and New Year’s Day, I am making no predictions about the state of my internet connection at the cabin for the next few days. This morning a 15 degree temperature with no wind feels wonderful. I stick my nose out of my burrow and find it a good day, a respite before that wintry mix returns to the mountain. This morning the dogs got a decent walk and both even behaved for once. I look forward to a day off as much so I can walk in daylight as for any other reason. I eagerly watch the sunset to see a new minute added to the day. My other "plan" for the holiday weekend is to start my 2010 bird list. For me, birding on New Year’s Day is as much of a tradition as pork and sauerkraut and more of one than the Christmas bird counts. I know many people who live for the CBC’s, but give me good birding weather on New Year’s Day instead and I’m happy. In any event, good or bad birding on January 1, you're going to hear about it and that's a new year's prediction I feel confident in making. If I were to make a resolution for the new year, it would be to find more time to spend outdoors, to pay more attention to what I see and to learn more about the things I do see. If I can do that, the rest of the year should take care of itself. Whatever your own plans, may you enjoy the start of a new year. Last night the wind roared across the mountain. I lost power so many times that I simply stopped resetting the clocks. It’s easier just to wait until the wind dies down sometime tonight. Hopefully by then the power will stay on. Fortunately, the trees in the forest are so far staying upright. This morning I picked up various branches and limbs—mostly long dead—that littered the driveway. With a temperature hovering around 20 degrees, a 40 mph wind makes for quite a wind chill. Suffice it to say that neither I nor the dogs were interested in a long walk this morning. The chickens are pretty much under the cabin for the winter and seem to be doing well, though it’s weather like this that makes me glad I’m not a chicken. I’ve placed tarps over their pen, which I hope blocks the worst of the wind. In the years when I did a lot of winter backpacking in below zero weather, I was always surprised at how well a thin nylon tent (and a good sleeping bag) kept me cozy inside. Still, I’m sure all of us will be happier when the wind dies down. I didn’t intend to be away from blogging for this long but weather and holidays and internet connections are variable and don’t always cooperate with my plans. Since I’ve been offline, I’ve had warm weather, an ice storm, rain, high winds and even a sunny day. During the ice storm, I had the traditional mid-winter "carpet" of juncos on my deck. I counted about 50, but the little devils move around too much to get a completely accurate count. In any event, that’s a lot of juncos on a small deck. The rain did in much of the snow and caused high water, though I don’t think it was quite high enough to be described as flooding. What the rain didn’t ruin, temperatures in the mid-40’s on one day did. One day of warm temperatures was enough to bring turkey vultures back into the sky over the forest, though wasn’t warm enough to bring the black vultures. 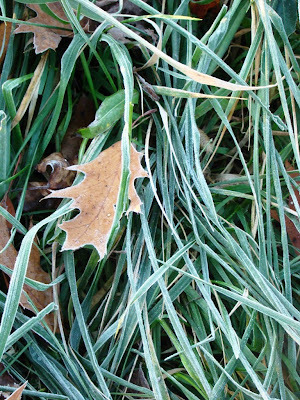 Unless I really get a thaw, I probably won’t see them again until February. So far no winter finches are plying my feeders, nor the feeders of anyone else I know down here. That isn’t really a surprise. The winter finches are pretty irruptive and it’s rare to get them two years in a row. Still, I always hope they will visit. Wild turkeys also came out of the woods—nearly a dozen of them yesterday morning. As I haven’t mentioned any animals, you may safely assume that I haven’t seen any of those—except for the ever-present squirrels. 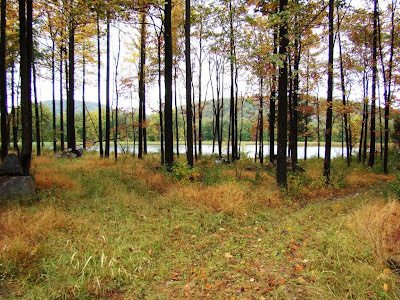 I did walk the perimeter of my little cabin yesterday, searching for prints and didn’t find any—not even the deer. I suspect they are bedded down somewhere and not moving around too much. All’s quiet now and the internet connection, such as it is, is restored. There’s nothing like a good snowstorm to fill the feeders with birds and empty them of food. Birds eat like sharks in a feeding frenzy during snowstorms. For me, it’s a good time to see lots of birds and to look for new birds. This storm brought out large numbers of juncos and titmice, chickadees of both species, more cardinals than I knew were around and lots more. I did not see any unusual species. I believe a reason for that is that it’s still very early winter, and some of the more unusual winter birds may simply not have arrived. Or so I tell myself. In other words, I didn’t have any purple finch, pine siskins or grosbeaks, let alone the rarer redpolls. 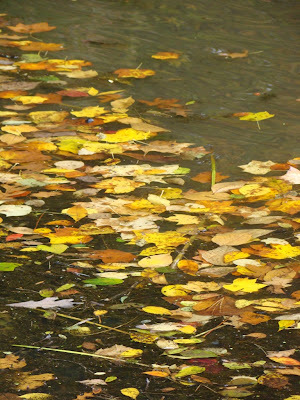 After all, until two days ago it was still fall, and kind of a normal fall at that, so even those northern species that might be inclined to head south at some point this year might not have gotten their bags packed to actually begin the trip. Perhaps my best sighting—and don’t hold your breath for it—was the first appearance of two Carolina wrens at the same time. I’ve always assumed that I had two of them, but they never appeared together before. I was also glad to see them for another reason. These little wrens tend to burrow in cavities near the ground, and heavy snowstorms can bury and kill them. They are also, apparently, sensitive to extremes of temperature. After a 20 inch storm in the mid-90’s, I didn’t see Carolina wrens again for several years. So I’m glad these two are staying someplace that can at least make it through a foot-deep snow with higher drifts. Weekend snow total at the cabin: About a foot. Electricity: Remained on except for several flickers. The little town 4 miles from the mountain was out for about an hour on Saturday afternoon. Chickens: Doing fine, thanks, though I couldn’t lure them outside the pen and into the snow. Dogs: Crazy. What is it about snow and dogs? Mine act as though they’ve run wild all their lives and have never had a moment’s training when they see snow. They don’t heel. They don’t sit. All they want to do is run and run and run. The nor’easter that buried the eastern cities didn’t hit quite as hard here as it did a bit further east. I ended up with about a foot of snow. On Saturday, the snow fell at about an inch or perhaps even two inches in an hour. Add in the wind, and it wasn’t quite a whiteout but it was close enough. The snow was light and fluffy. I’m not sure I could have made a snowman even if I’d tried. I could almost broom it off the front deck, it was that light. This is the kind of snow I’m more likely to get in mid-winter than the last day of fall. Usually, the early-season snows are what I call "concrete" snows that have enough water in them to make a really wicked snowball. The snow ended late Saturday evening, and on Sunday morning I was out shoveling and then playing in the snow a bit. It was tough to do much snowshoeing—too fluffy. I sank down to the bare ground, I think. The feeder birds arrived at my feeders in droves. The back deck was littered with juncos and chickadees. For the first time ever, I actually saw two Carolina wrens at the same time. I’d always known there had to be two, but they always took turns at the feeder, and I’d never seen the pair together before. I didn’t have anything unusual show up at the feeders, but I certainly fed the masses. I filled the feeders three times on Saturday. My photo today was taken yesterday evening at sunset. 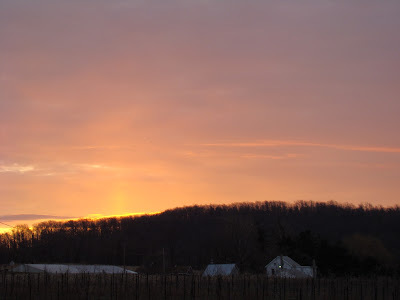 As today is the solstice, I wanted a photo showing the sun at its southernmost setting. The sunset is firmly in the southwest and not too far from south-southwest. By June the sunset will be in the northwest. By my opinion, which I know counts for nothing, the day after solstice should be the first day of the new year. What better time to start a new year than the day the light begins, however weakly, to add minutes to the day’s length again? The next time I say life is normal, please slap me. I love snow, I truly do. But after spending last weekend in New Hampshire and now facing a forecast of 6-12 inches of snow the weekend before Christmas, I am so far behind in preparing for the upcoming holiday that the only way I could catch up is if we move Christmas back a week—or maybe two. I was afraid this would happen. Somewhere in the deep recesses of my mind, I looked at that storm on the radar down along the Gulf of Mexico and didn’t believe it when the forecasters said my area was only going to get a couple inches of snow. Last night the last thing I did before I turned off the light was to listen to the forecast. They were still saying 2-4 inches of snow, with my county’s prediction pegged at 2.5 inches. So, what happened? Did I sleep for days? No, I didn’t. A mere seven hours later the forecast is now for 6-12 inches of actual snow, followed by wind, with 2-3 feet of wind-driven snow not out of the question. Yikes! 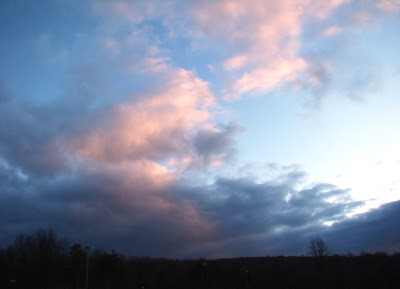 This morning, I can see the snow clouds moving in across the sunrise. Those pretty rose and mauve colors don't light up the sky every morning. The prettier the sunrise, the worse the weather to follow. Tonight, I’m going to be running until midnight—stocking up on bird seed, more chicken food, food for the holiday. Then I’m going to ready my snowshoes and hunker down. Snow's ahead! 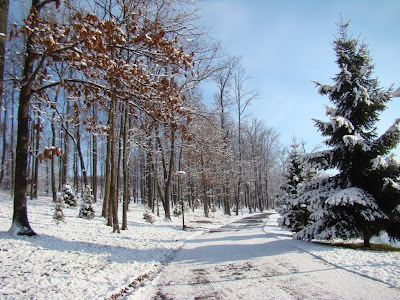 December once again feels like December here on Roundtop. Late last week, the temperature plunged into January range, with a brutal north wind. Then the temperature rose into early November range and felt balmy. Today, all the drama is over, and the day is simply typical for December. Overnight, clouds rolled in and brought snow showers that gathered flakes along one side of my driveway but not the other. In December, it’s not uncommon for this to happen almost every night. I, too, feel as though I am returning to normal after the drama of the weekend just past. Between the pleasure of the long trip to New Hampshire and the terror of frozen ice and a highway littered with accidents, normal feels pretty good right now. In my case, normal could also be a euphemism for nothing much is happening right now. And certainly nothing unusual is going on. 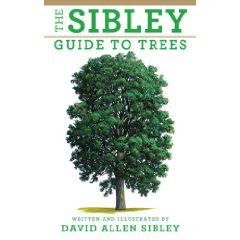 The closest thing to unusual was a quickly glimpse of an immature yellow-bellied sapsucker and that only barely qualifies as unusual. 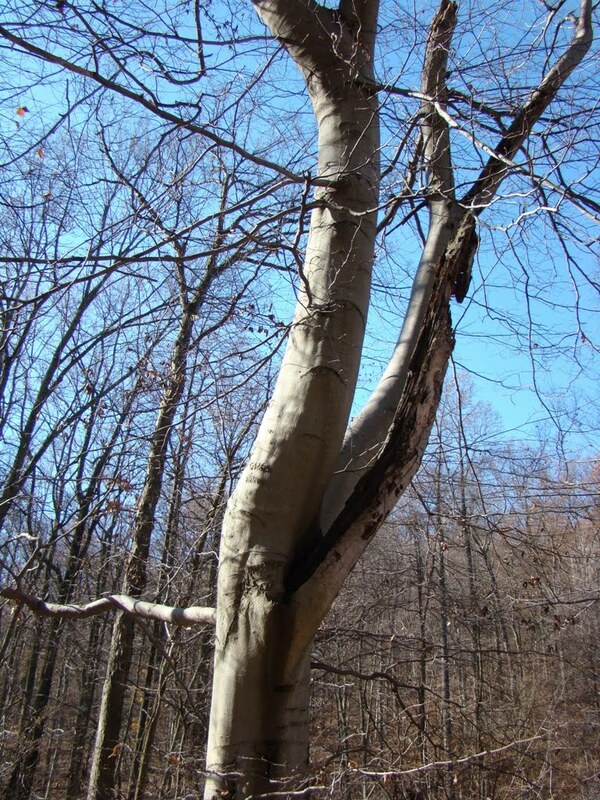 An immature sapsucker in December almost qualifies as a birding cliché. It’s true that I don’t find sapsuckers every year in December, but when I do find them, they are always immature birds. 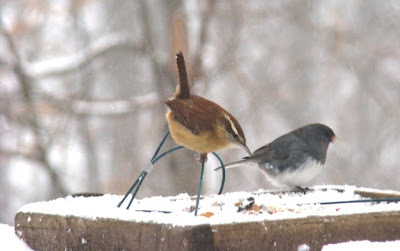 They hang around, eating my suet, until the first really harsh snowstorm arrives. Then they disappear. That's normal, too. A few photos of this lovely lady are the only photos I took in New Hampshire. It was a 9-hour drive north, followed by a morning-to-night meeting on Saturday, followed by a 13 hour, freezing rain-delayed trip home. 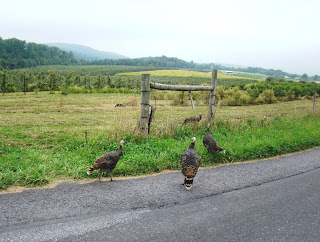 The only birding I got done was when two flocks of wild turkeys blocked the mountain road I was on. They stood there looking at the car before hopping over a snow bank and disappearing into the woods. So my hope of a week’s worth of New Hampshire photos to post on the blog did not materialize. I should probably say a few words about this lovely lady. 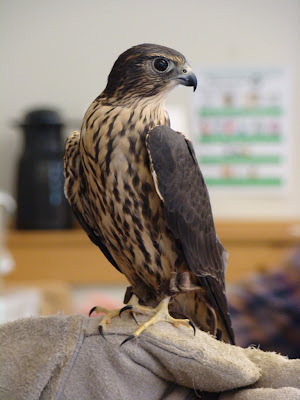 She is a 12-year old merlin, an education bird at Squam Lakes Nature Center in Holderness, NH. An injury to her left wing keeps her from flying more than a few flaps. I was impressed by her for a couple of reasons. The first is simply her age. It’s amazing to me how long a wild bird or animal can live in captivity compared to their life in the wild. The other thing about her that is especially impressive is how calm she is. Of course, that’s what an education bird is supposed to be, but merlins are notoriously, um, not calm. This bird was absolutely the calmest merlin I’ve ever seen. She sat calmly and seemed content, where people were peering at her or while she was being carried. 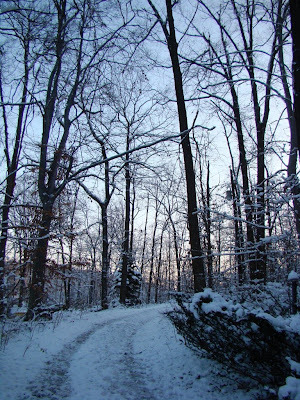 Winter is arriving on the last days of fall with something of an attitude here on Roundtop Mtn. After snow, rain and slush, the wind is bone-chilling, and the temperatures are falling into the January and February range. From my experience, I’m already expecting a thaw. Of course, I have to get through this weekend first. And speaking of weekends, I am heading to New Hampshire tomorrow. Two full days of driving for one full day of meetings with the Hawk Migration Association of North America await me. And some good meals and chats with good friends to soften that drive. In any event I should be back online on Monday, hopefully with a few good photos taken in New Hampshire for your viewing pleasure. My little cabin in the woods is almost invisible in this photo. In summer, it is invisible from this spot. In winter I need a little snow cover to keep it invisible. Overnight, another inch or two of snow fell, and then the rain started. At the moment everything is a slushy mess. Tonight, it will likely turn into a frozen mess, unfortunately. This morning I couldn’t even entice the dogs to play in the snow. They don’t much care for the slush either. One thing about living in the woods that I never seem to get used to, for some reason, is that travel can be difficult to impossible up at the cabin, but once I get off the mountain, it’s a different world. Down in civilization, the roads can be just wet or sometimes even dry, when up at the cabin I can barely get out or around. That sometimes extreme difference can make it difficult for me to decide if I should head in to work or not. And for those times when the difference between here and there is at its worst, I have to suffer the unbelieving looks at work when I tell them I couldn’t get out. This morning wasn’t as difficult a choice as I’ve sometimes had. The schools had a two-hour delay, and I was thinking I might have my own two-hour delay as well. But I managed to get out and discovered merely wet roads once I reached a public road. Most of the time, I love the difference between life at the cabin and life down in the city. After all, that’s why I wanted to live in the cabin in the first place. It’s only explaining to my boss about my difficulty getting to work when the roads are dry down in the city that’s a bit uncomfortable. 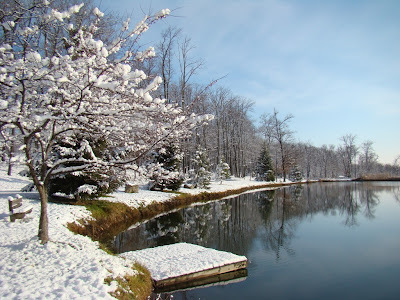 Snow from this past weekend remains around my cabin today, as the temperature has stayed cold. The major difference between the photo I’m posting today and the current reality outside my door is that the sky is now overcast. The dreaded "wintry mix" is expected later, which should it arrive as predicted, will ruin this pretty little snow and replace it with something less pretty. In this area, a "wintry mix" is essentially a euphemism for freezing rain. Sometimes I wonder why they don’t just say freezing rain, as "wintry mix" doesn’t seem to mean anything else. Oh, the forecasters say it could also be rain or sleet or snow, but I can’t even tell you the last time the forecast for a "wintry mix" produced something other than freezing rain. For the moment, I am trying to take some comfort in that my county is supposed to get less of that than counties to my west and north. Still, I live on a mountain and forecasts are notoriously wrong, so I’m not dancing just yet. Although it’s dark when I get home, I’ve still circled around the cabin a few times, looking for tracks in the snow. I haven’t found much other than deer, which is just as well. My chicken pen will keep out raccoons and fox, but I don’t have a prayer against weasels. The chickens are close enough to the cabin that I can hear them squawking at night, should something attempt to breach the pen then. Of course, that assumes I would be at home to hear them. I’ve never actually seen a weasel within a mile of the cabin. I just hope that continues. Snow fell on Roundtop this weekend, a bit of a surprising snow in a couple of ways. This was the first snow of the season, and it’s uncommon for the first snow to be measurable. It’s also unusual that first night with temperatures that were below freezing all night ends up producing any snow at all. Up at the cabin I got 4, perhaps 4.5 inches of snow. It soon began to compress, though, and this morning I only have about 2 inches left on the ground. The event was a pretty little snow that stuck on the trees and branches longer than is typical. I took enough photos that you will be seeing snow photos on this blog all week, even if the snow doesn’t last that long. This was the chickens’ first experience of snow, and I don’t think they much liked it. When I opened the pen Saturday afternoon to let them out, they rushed the gate as usual but stopped dead when they got to that weird white stuff on the ground. Eventually they stuck their heads out and pecked at it a bit. They soon discovered they could avoid the snow and go back to pecking in the dirt and ruffling up the leaves if they stayed underneath the cabin and the back deck, where the snow didn’t penetrate. The dogs are an entirely different story. They both love the snow. They forget everything they ever learned about walking nicely on a leash when the ground is white. They pull and lunge, and you’d never know that they do usually behave. Even after they run in circles and push their noses in the snow, they still don’t want to act as though they know how to walk nicely. I enjoyed playing in the snow, too, though there really wasn’t enough of it to ski or snowshoe in. Maybe next time. Winter is here! Snow. It might, here, this weekend. It’s in the forecast, though I can’t say that I yet feel it in the air or see it in the sky. Maybe this afternoon. For now, even a hint of snow--and on a Friday to boot!—is the kind of good news that doesn’t come along every day. My photo today is of open water. With snow in the forecast, this is a sight I can’t expect to see for too much longer. 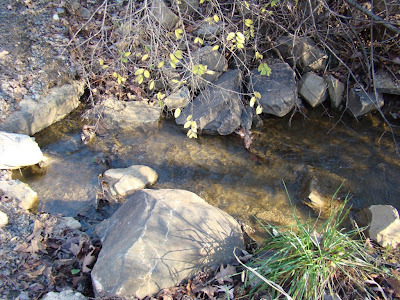 True, this water is moving at a decent clip, which will keep it open longer than in places where the water is still. Even so, the time of freezing fast approaches. 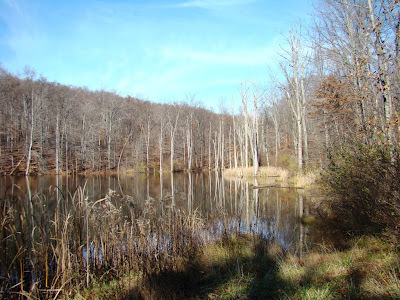 Will this be a year when the ponds stay frozen into late March or April? Will this be a year of many freezes and thaws? None of us can say. The future is a mystery even deeper than the forest. I know winter lies ahead, but not what winter will bring. Those secrets are held close. So today I will celebrate the open water, knowing the time for it is short. The time of its return is unknown, so I have to be content only with the knowledge that it will, one of these days, return. This morning before sunrise I am greeted by the sight of Mother moon, hanging above the twin bumps of two, old Appalachian mountains. Sometime during the night, the rain spent the last of its moisture and moved off, leaving the air crystalline and sharp, the sky clear. Ah, that lovely old moon! She has seen it all, hasn’t she? She has seen those mountains rise and now she watches as they wither away, to eventually be rounded into hills and at some point, not even that. And still, I expect, she will watch. I have often thought that the trees of the forest around me would have quite a tale to tell if they could. But that tale is nothing compared to what the moon could tell us of what she has seen. This morning, as on all mornings, she is silent and her light is blue and cold. Sometimes when I look at the thermometer, I can’t believe what I see. Today was one of those days. It felt so raw and damp that I thought the actual temperature must be at least 10 degrees cooler than it was. The chill wound its way under my coat and up my sleeves. As soon as I could, I came inside the cabin and got a heavier coat. Temperature and how cold or warm I feel do not always track together. I’ve wandered around on cold, dry, sunny winter days with an unbuttoned jacket when the actual temperature was below zero. Today, the temperature was only flirting with freezing, but you couldn’t have guessed that by the coat I ended up wearing. In describing this phenomenon, weather people usually talk about wet bulbs and dry bulbs. That’s really just the scientific way of factoring in how moist the air is. When the air is moist in cool weather, it feels worse than the temperature would indicate. Add in a little breeze, and it feels even colder. A friend who was originally from the Green Bay area used to tell me that he felt colder in winter Pennsylvania than he ever did in Wisconsin. Their winters are dry cold; Pennsylvania’s are usually a wet cold that feel far worse than you’d expect. This morning is overcast and raw, so you can safely assume today’s photo wasn’t taken today. 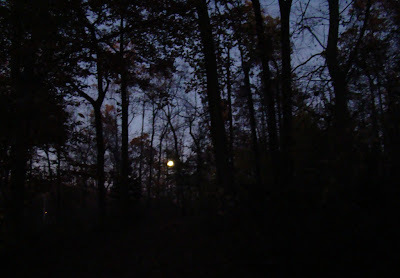 Even though last night’s full moon was obscured by the high cirrus clouds, it still managed to brighten the forest. Both great horned owls and a screech owl called late into the evening. The red foxes were barking at each other higher up on the mountain somewhere. They were all, I think, taking advantage of the added light despite the chill. Tonight, it will be warmer but raining. I expect the woods will be quieter as we all try to shelter from the rain. The nights are growing cooler, literally with each new turn of the sun. Last night I was forced by a damp east wind to put away my lighter jacket and seek a heavier one. A bit of ice now greets me in the mornings where open water sits still and dark. Last Friday evening a cold wind blew in tiny, stinging needles of snow. Winter is coming. It is almost here. By day’s light, the coming season is less in evidence. Winter sneaks in during the night and now tries to muscle in during daylight, too, though it is soon chased away. Each day that chase takes a little longer before warmer temperatures win out, at least for this day. Rifle deer season opened this morning in Pennsylvania, a really big deal around here. For me, it means the dogs don’t get a walk in the morning for the next few days and I will be living with wild animals in the cabin until it’s safe for us all to take an early morning walk again. Rifle deer season lasts two weeks but usually the woods are much depleted of hunters after three days. Deer season also means I will be putting up with hunters driving up the lane at 5:30 a.m. and listening to the dogs howl in outrage about that. That’s the part I can do without. The part I look forward to is the hope that at least one of the hunters in my family will get a deer and then give me a bit of the venison. 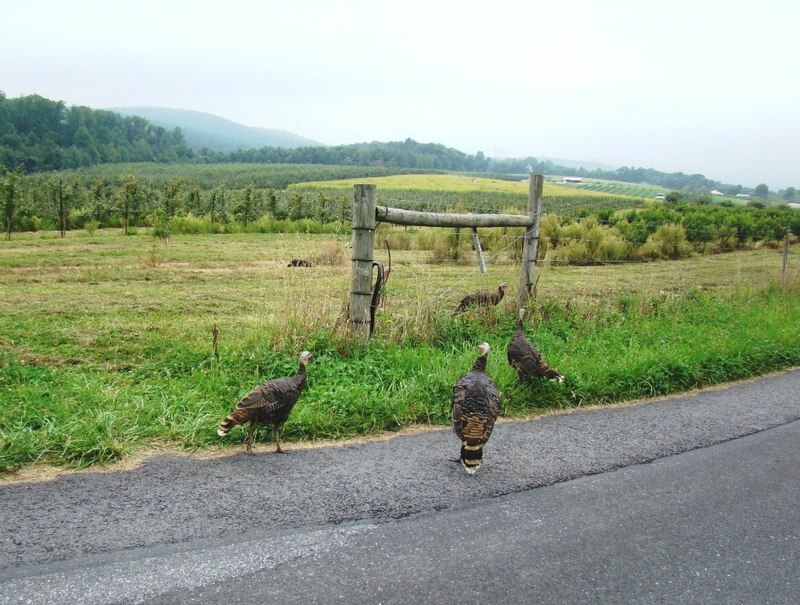 In Pennsylvania, there’s a whole hunting culture geared around going to "deer camp," or "beer camp" as I’ve heard more than a few deer widows grouse about it. The season frequently involves hunters banding together to purchase land and build a shack, excuse me, a "hunting cabin," up in the mountains somewhere. They go up there and may or may not kill deer, depending on the camp. Some camps hunt hard; others really are more like beer camp. Oftentimes hunters ignore the deer trophies wandering around in the nearby cornfields, their heads weighted down with large racks. They wouldn’t have to leave home for a week to hunt one of those, you see. Why is that, I’ve always wondered? Why the whole deer camp extravaganza when there’s plenty of deer getting fat in the fields? Apparently, the answer today is mostly one of perception from the past. Fifty years ago and more, deer in PA were rather confined to the mountains. The deer were over-hunted until early in the 20th Century when states took over management of wildlife. Before that, many states allowed hunters to take as many deer wildlife as they wanted. I’ve read articles where before licensed hunting, at least some hunters bagged more than 100 deer in a season. After around 1916 or so, hunting was licensed and the numbers of deer any one person could kill became regulated. Deer were uncommon before hunting was regulated. I’ve read stories that you could walk all day and never see a track, let alone a deer. Even my father remembers rarely seeing deer in fields, and he’s lived on the same farm all his life. Hunters pretty much had to go to the mountains to find deer at all. And hunters back then came home with the usual hunting stories. Kids, mostly boys, could hardly wait until they were old enough to join their elders at deer camp for the hunting and festivities. That hasn’t changed, though restricting the number of deer killed has vastly increased the number of them. 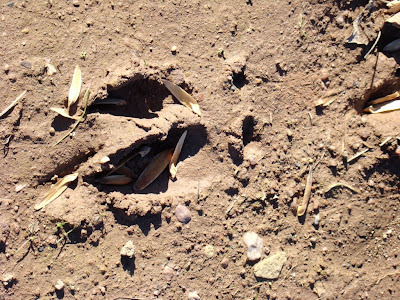 Today, deer seem to prefer life around fields where they can browse on corn or apples. Apparently surviving on forest undergrowth and acorns is a tougher go. With the greater numbers of deer that are around today, deer congregate where the living is easier, and that seems to be more around fields than in the mountains. But of course, going to the neighbor’s field to hunt deer isn’t as exciting as a week up at deer camp. That part sure hasn’t changed. 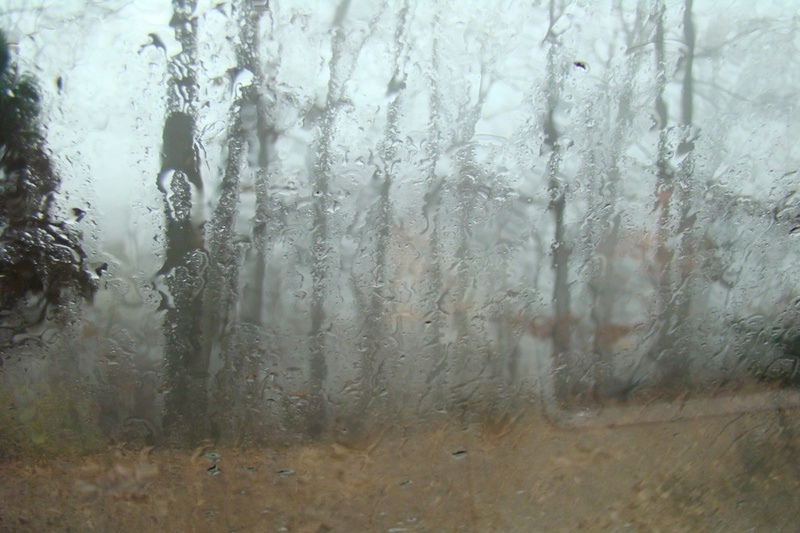 The traditional November dreariness continues here on Roundtop, making photography pretty much impossible for the moment. As it’s the day before "turkey day" here in the U.S., I decided to post a few of my Wild turkey photos to help start off the holiday. Tomorrow I will be eating a traditional Thanksgiving meal, including turkey, though not wild turkey. To that we are adding baked corn using my grandmother’s recipe and made from local corn and eggs from my girls, apple crisp (my great-grandmother’s recipe) made from local apples for dessert, chestnut-sage stuffing, green beans, sweet potato casserole, homemade cranberry relish and probably a few other things. We will all eat too much and enjoy every minute of it. If you are celebrating tomorrow, you do the same. Today is nearly the quintessential dreary November day. It’s rainy and breezy and foggy this morning. The only thing that’s not perfectly stereotypical is that it is a few degrees warmer than the quintessential November day. But the weather may even reach that exalted state of dreariness before the day is over. 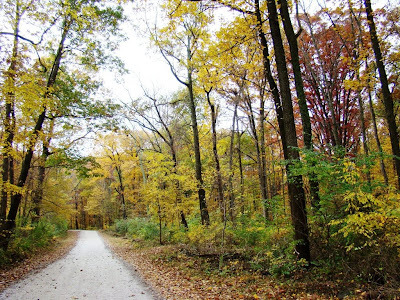 My photo today was taken at Pinchot State Park, just a few miles from my cabin. I took it before the rain started, so you aren't getting the full level of current dreariness. Make no mistake. I am not really complaining. I’m just stating facts, and after all, it is November. What would November be without at least several of those stereotypical days? This morning I was forced to leave my porch light on as I left the cabin. Last night I fumbled around in the dark when I got home. I’ve been avoiding leaving the light on for several days now, even though I knew this day was fast approaching. Leaving the porch light on so I can see when I get home in the evening marks another milestone in the year. It will be late January before the days lengthen enough that I can turn it off during the day again. Although if I have snow on the ground, sometimes that creates enough contrast that I can bypass the porch light. I’ve also reached the point where I see that my bird feeders empty during the day, but I have no idea who is doing the emptying. I leave before the birds are attacking the feeders, and they are a-roost before I get home. Birding is now a weekend event only. Some things about winter aren’t really my favorite things. It will take some snow on the ground before I grow thrilled with the cold season again. Hopefully, it won’t be long before that happens. Late fall is such a teaser. One moment it’s clear and gorgeous, even warm. Then the sun goes behind a cloud, and it’s time for a jacket, maybe even a heavy one. The changeable weather isn’t unusual, but the change in how I dress when I go outside confounds me for a bit every year. Yesterday was nearly shirt-sleeve weather during the mid-day, and today I’ve had to search for a heavy sweater. Some days I wish I were like the dogs and could just grow a nice winter coat for the new season. That sure would be cheaper. Today’s photo is one of the many American beech trees that inhabit the local forest. They are a common sight, though too many of them have initials and hearts and what-all carved into them. Beech trees don’t do well in cities, apparently they are sensitive to carbon monoxide. Their roots are shallow but tend to take up just about every square inch of space underneath them. And their leaf canopy blocks sunlight. So nothing much can grow underneath beech trees. I have two large ones in my front forest, both the same size. This is one I found down in the valley below Roundtop. 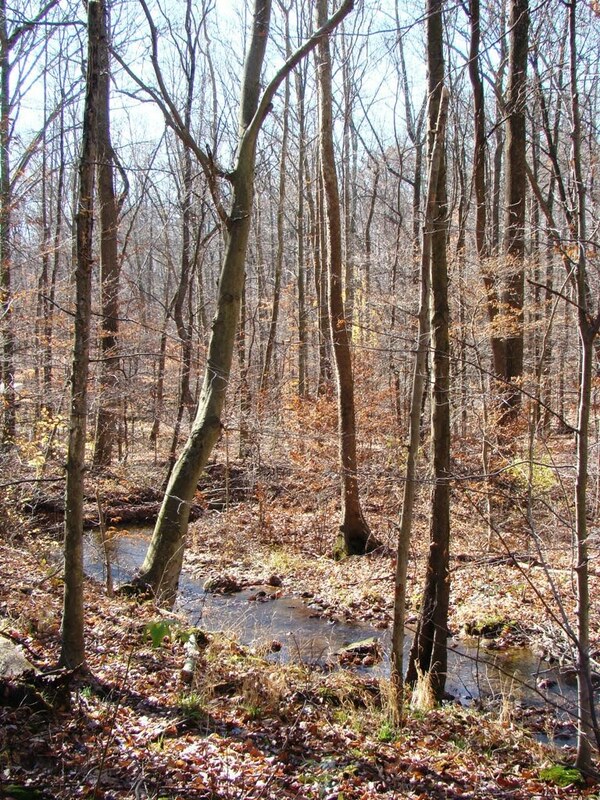 They are often found in the final stage of forest succession, and they like this area because of the amount of annual rainfall I see here, typically 30-50 inches of it. The temperature also suits them. They can tolerate the cold better than heat above 100o. Perhaps they will be a good indication of future climate change in this area. I find them a very pretty tree with their gray bark. There’s another reason I like them, too. Even with their shallow root system, they are considered to be rather rootfirm. I like that in a tree, especially in the trees around the cabin. 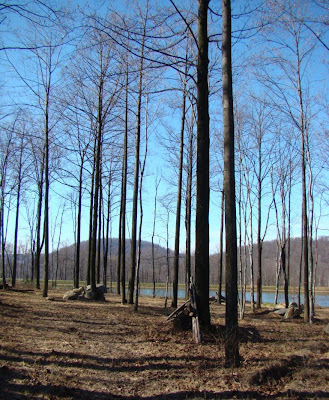 Most of the trees in Roundtop’s forest have long since lost their leaves, but a few decided to wait for a while. This little maple tree is among the very last to hold onto its leaves and its color. Perhaps it just wanted to shine on its own for a bit without competition from all the other, bigger trees around it. In an event, this is the last tree I could find with leaves and with color. 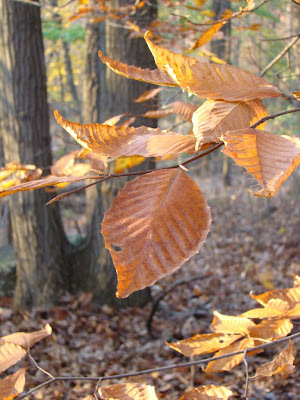 The marcescent leaves, mostly on the beech trees, are still hanging on, though they are withered and dry. They usually hang on until spring’s new leaves will finally push them out. 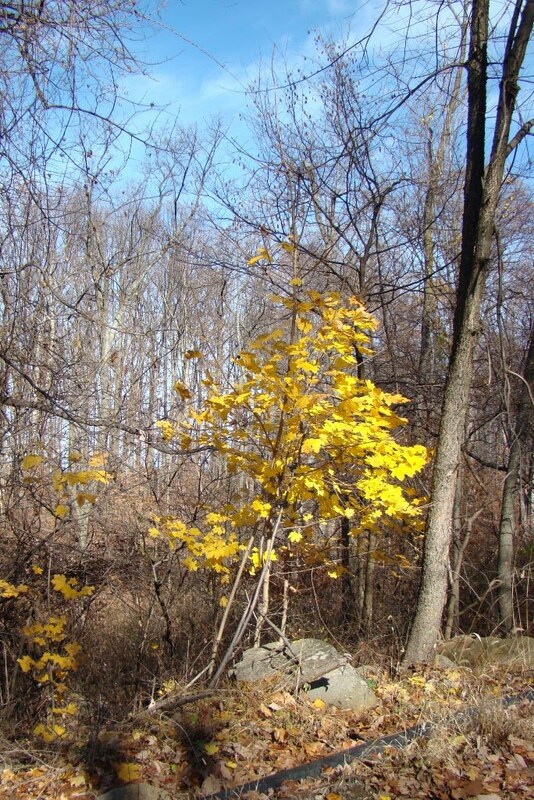 These maple leaves, though, are like a beacon of yellow in a sea of brown that I can see from a hundred yards away. It’s funny, I think, how my eye naturally moves toward whatever is different in the landscape around me. In the summer, I look for things that are not green. 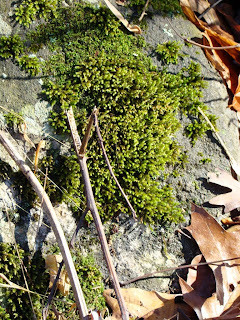 In late fall and during snowless winters, I look for things that are not brown. It’s the different things that catch my eye, no matter what the season. Perhaps I should spend some time exploring the subtleties in the things that at first appear to be the same. Maybe I’ll make that my project this winter. This morning, I can’t see the forest for the fog. And the rain isn’t helping either. So the forest and its creatures are hunkered down on a November day waiting for the weather to improve. It could be a lot worse. The rain today doesn’t feel nearly as cold as the near-freezing rain of two weeks ago. The hunkering down today is more for comfort than necessity this time. In November, that’s about as good as you can hope for. At least it’s good enough for me. The dogs didn't mind if we didn't take the usual walk this morning. A shortened walk suited them as well as it did me. A headlamp in the fog doesn't work any better than headlights on the car. I stumbled more than once and that was enough. Time for a hot mug of tea. My foray into the valley between Roundtop and Nell’s Hill this past Sunday produced a couple of interesting finds. Do you know what this photo is of? It’s an exploded puffball fungus. I’ve never noticed one post-explosion before. During the summer the camp kids were excited to see the "green smoke" of spores that spouted whenever I tapped one with my hiking stick. This one is not only post-explosion, it’s likely also in the decaying mode. I found it interesting to see what they look like when they are fully exploded. The second interesting thing is the little plant in today’s second photo. I just liked the pattern on its leaves and figured it was something interesting but didn’t know what it was. Digital photography is a great help for identifications of anything. This little plant is actually an orchid—a downy rattlesnake orchid. 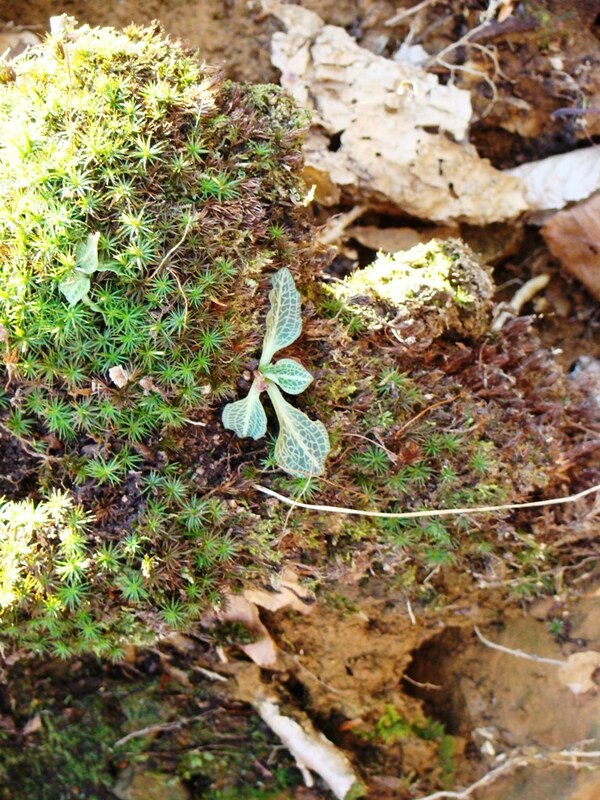 It’s also commonly known as downy rattlesnake plantain, but that name is a misnomer as it’s not a plantain. It blooms from mid-July to September and the flowers aren’t very showy, at least not in the way a lady’s slipper or fringed gentian is showy. Perhaps that explains why I didn’t notice any blooms when I was walking with the kids down here well into late July. Or perhaps this little plant didn’t bloom until August or September and I simply missed it. Or perhaps it didn’t bloom at all this year. Most of the photos I saw of the plant showed several more leaves and seemed to be at least slightly larger than this tiny version. Notice also a second, even tinier plant with just two leaves to the left of this larger one. 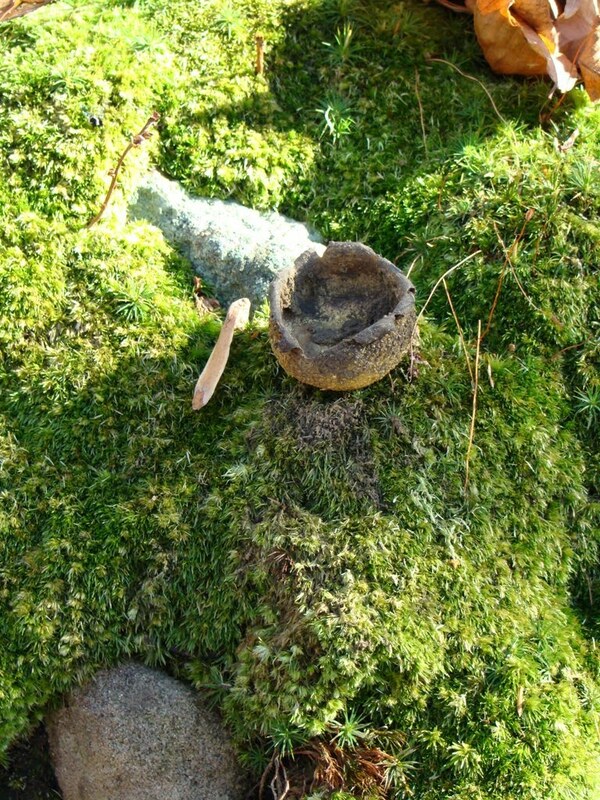 The downy rattlesnake is known for growing out of moss, as this one is, and likes moisture. This past summer was both wet and cool—likely ideal growing conditions for it but who knows what next summer will bring? Perhaps this was the first year for it. I hope I can see it blooming next summer. I plan to be looking for it, in any event. 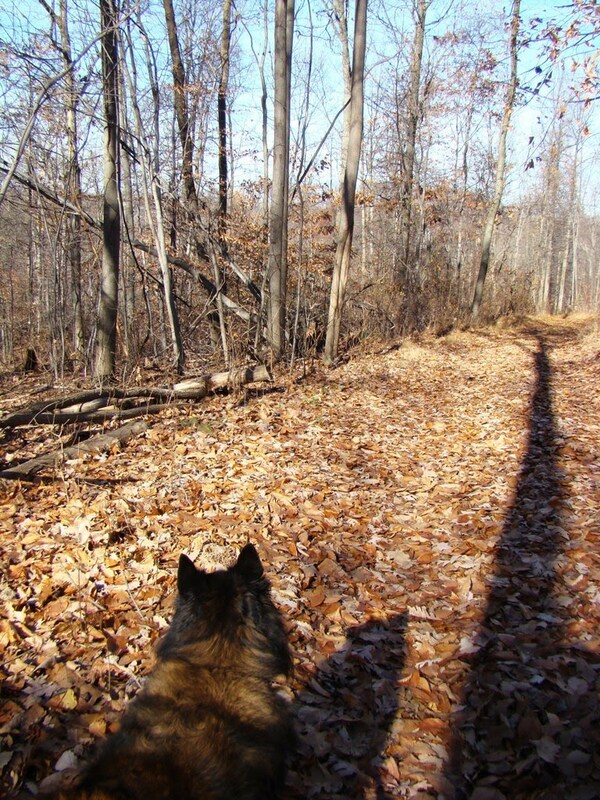 Dog and I enjoyed a pleasant walk down through the valley between Roundtop and Nell’s Hill. In this area, many of the valleys between mountains have been cleared and homes built through them. 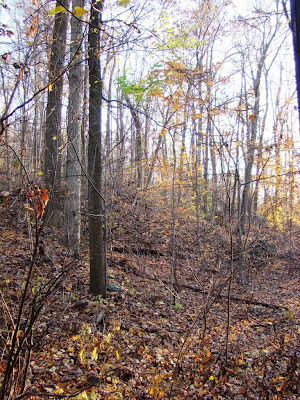 The steep hills remain largely forested and undeveloped, but the flatter valleys are usually considered prime territory. So I am lucky to have a forested valley so near my doorstep. The habitat down in the valley is moister and shadier than up on the hills. Sunlight doesn’t penetrate until midday. Down in here are lots of ferns and other moisture-loving woodland plants. In the summer the valley is filled with ferns, thousands of them. The little Beaver Creek runs through the center, and the temperature is much cooler. 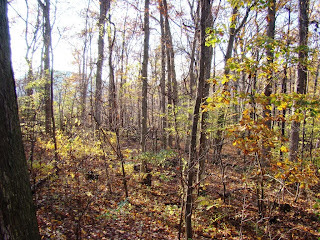 During the fall, sunlight penetrates a bit earlier in the day, though is always filtered by the trees of the forest. 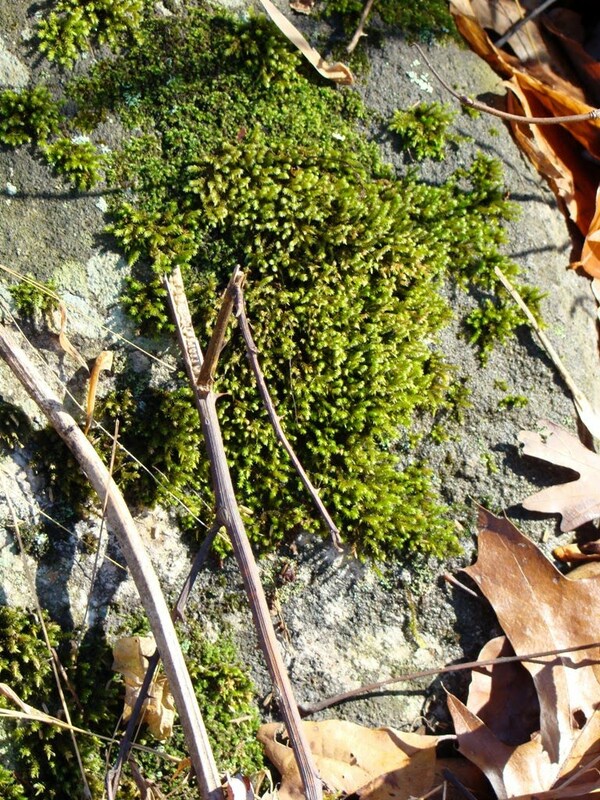 Except for the ever-green Christmas ferns, the other species are brown or gone by mid-November. 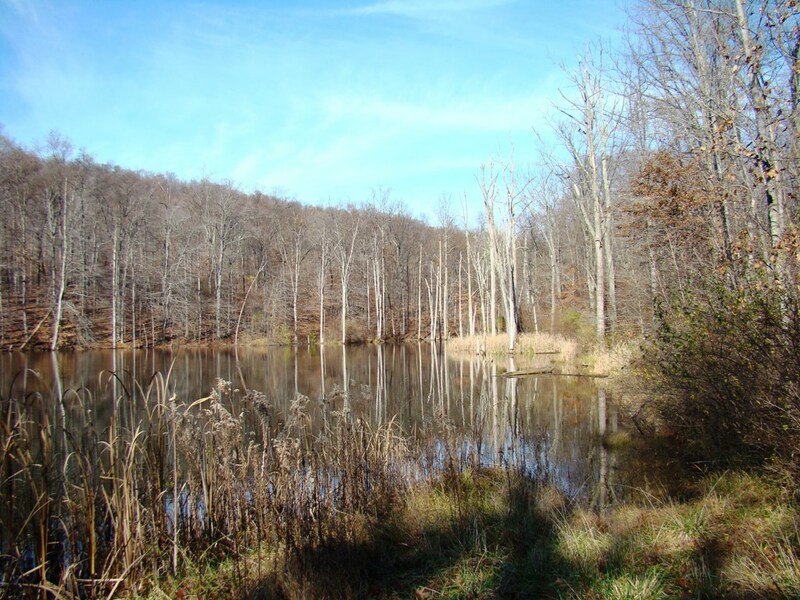 There’s a nice pond down here just under two miles from the nearest public and paved road. 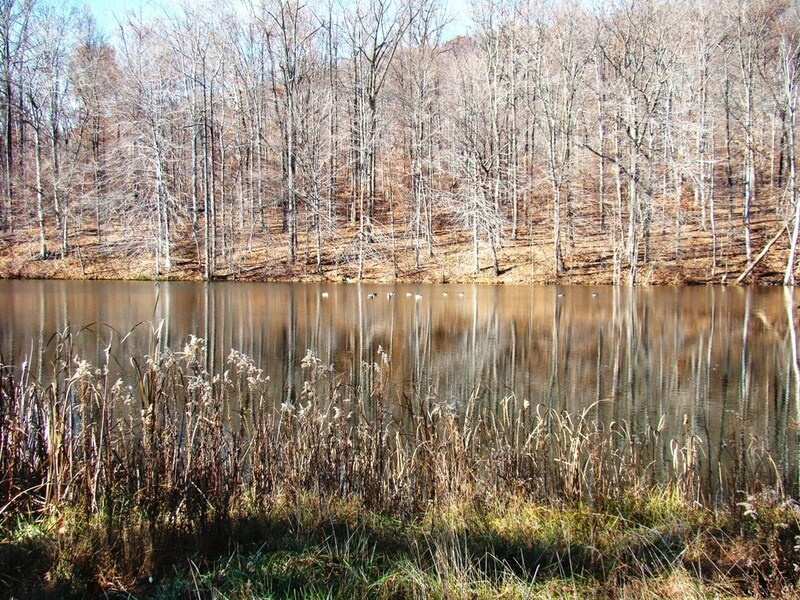 The pond is the only nearby opening in the forest, and I enjoy coming down here and just sitting, listening to the quiet on a calm day when there are no leaves to rustle and break the silence. Sometimes I find interesting birds down on the pond or near it. Not today. A dozen wary Canada geese eyed me suspiciously but I saw nothing more unusual than that. You can see them in the second photo, somehow blending in with the browns of the trees and cattails. 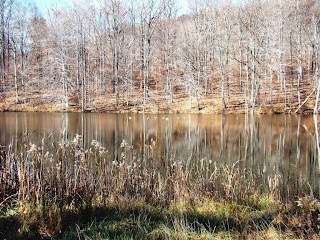 The blue jays screamed, the turkey vultures took advantage of thermals over the pond to swirl overhead. A Red-tailed hawk caught the air and joined the turkey vultures. Dog sniffed in the mud along the banks. It was a pleasant hour or so. Nothing too much happened. That was the best part. 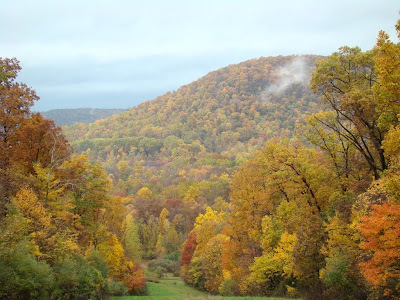 After a cool summer and a cool October, November at Roundtop is shaping up as unusually mild. On Sunday the weather was especially pleasant—blue sky, calm winds and sun. 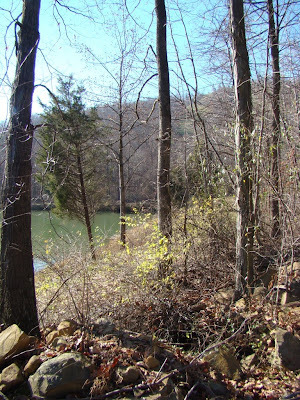 Dog and I both needed an outing, so we took advantage of the day and headed down into the woods and along Beaver Creek. The distance we covered wasn’t very much. I enjoyed ambling along and looking at anything and everything that caught my eye. I stopped every few feet to look at something or take a photo. 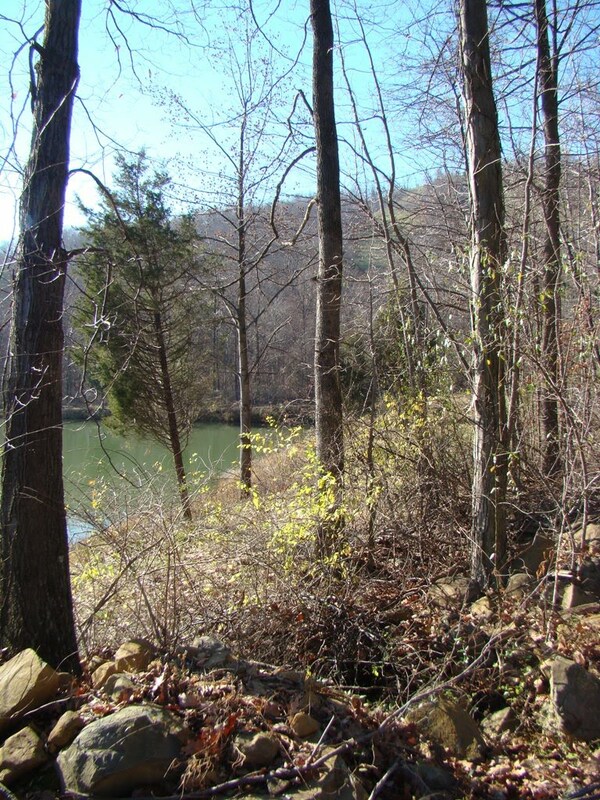 The area where we walked is where I take the kids from Adventure Camp in summer. For them, I have to find things that are big and exciting and keep the pace moving. Now that I didn’t have the kids along, I could enjoy the day on my own terms. I haven’t been down here since the leaves dropped, so the difference is, as always, a bit startling to me. Perhaps I simply startle easily. With rifle deer season just two weeks away, it’s hard to say when I will get down again. I’d like to think my Sundays will be calm enough that I can come down every week, but I know better than to make predictions. After a summer encased in greenery, green is now much harder to find. Christmas ferns are still green. The other 4-5 fern species that I found here this summer have disappeared into the forest floor. I can’t even find their remnants. 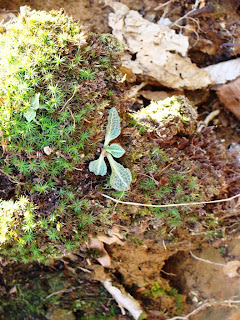 The other green I found was moss, which is growing very nicely and looking very healthy. That was pretty much it. 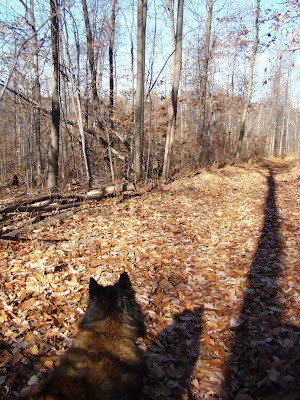 Dog found a deer—a large doe—and innumerable squirrels to keep his attention. I also saw Canada geese down on the pond. Blue jays scolded as we invaded their woods. Chickadees joined in, as did the white-breasted nuthatch. Other than that, the woods were quiet. Of course, where I live, it is most often quiet, and so doesn’t seem unusual to me. In fact, I have grown to expect quiet, though other people always remark on the quietness when we are down here. If the November weather could have been any better for a walk in the woods, I don’t know what I would have done to make it better. Quiet, blue sky, comfortable temperatures and calm wind add up to perfect. The only thing that would be better if if I could walk down here every day. 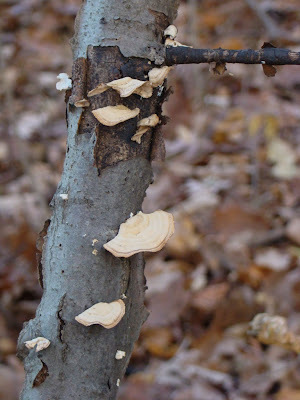 I think the tree fungus in today’s photo is false turkey tail, but please don’t hold me to that. Every time I think I’m improving my fungus-identification skills, I find another 20 species that seem to fit just as well. Not only is my learning curve on these things steep, but I’m starting to think it’s approaching hopeless. I enjoy looking at and for woodland fungus, but you should probably take my poor attempts at identification with a grain of salt. Maybe I should just stick to birds. I’m pretty good with those. A good many birders I know bemoan the days of winter birding as unexciting, but I don’t agree. It’s true that this time of year it’s difficult to find, say, 50 species of birds in a few hours of birding, but I find other compensations. This is a good time of year to spend more time watching the birds do what they do. In May, it’s easy to get caught up trying to find that next good bird than it is to think about spending much time with something as common as a song sparrow. In November, the odds finding unusual birds are much higher, so you might as well pay more attention to the ones around the yard. And if you are a new birder, now is the perfect time for birding. Spend some time getting to know the local and common birds so that when May or April comes around, you can focus on the visitors. 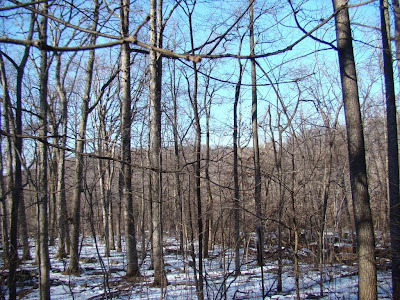 For me, winter birding is pleasurable because my view into the forest is now unrestricted by greenery. The birds are no longer just a brief flit between leaves. I can actually see them and watch what they’re going. I guess this is all just by way of saying that I’m ready for Saturday when I can spend a few hours in daylight fooling around and looking for birds. Happy Friday! 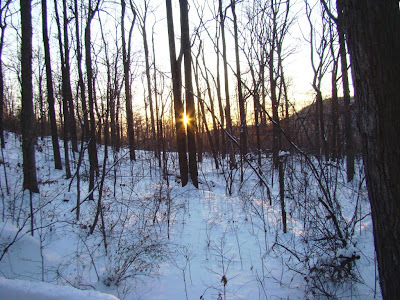 The daytime quiet continues here on the mountain, though last night Dog and I encountered a deer walking down my driveway as we were walking up. The deer stopped and looked at us. Dog stood up on his hind legs, balancing with the tension in the leash, and everybody stared at each other for a bit. Then the deer calmly ambled off the driveway and into the woods. My arm still hurts from Dog trying to follow. I’ve wondered if the deer was one of the pair that ate my juniper bush last winter. It certainly wasn’t afraid or wary of us. And the raccoon again. That large and furry mammal has now destroyed the new platform bird feeder I just got this year. It's tossed the plasic "windows" down into the woods. It's pulled the top off and eaten, I think, the rope. The suet feeder along the side is pulled off. Ah, life in the woods. Never a dull moment, not even when it's quiet. Quiet is how the mountain is today. The air is still, and few birds are moving or even out looking for food. Nights are busier here this week. The routine of Baby Dog howling in outrage when a local raccoon raids the bird feeder at 2 or 3 or 4 a.m. is predictable. I get up, flip on a light, watch the raccoon scurry away and go back to sleep. If I don’t get up, Baby Dog continues to howl and listening to her is worse than getting up. In the morning I barely remember it. Deer are moving every night, and I’m finding them in places where I don’t usually see them. 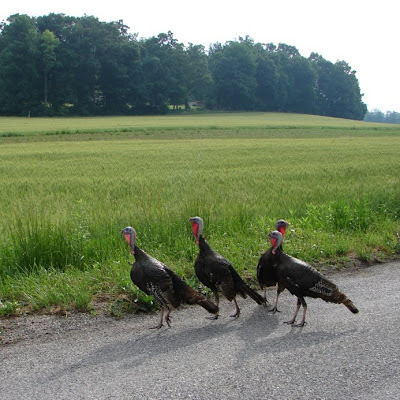 They are in the lane, galloping uphill along the dirt road like horses, or next to the chicken pen or beside the cabin within arm’s reach. That drives the dogs nuts, too. To replace the long-departed summer pewees, the great horned and screech owls are nightly callers. The Canada geese are always up to trouble, too. They are always fussing about something, even in the middle of the night. Sometimes I wish I could sleep during the quiet day and spend more time outside at night, seeing what else goes on. Maybe one day but not this one. The "brown" season is settling in here at Roundtop. After six months of being surrounded by green, now I’m surrounded by brown. I’m still adjusting to that, in part because the change happened unusually fast this year. Normally, the colors of fall hang on for a while, sometimes for a long while. This year the colors were gorgeous for a day and gone literally overnight. Yesterday the weather was a bit warmer than is typical and combined with a sunny sky and calm wind, the day felt wonderfully warm. 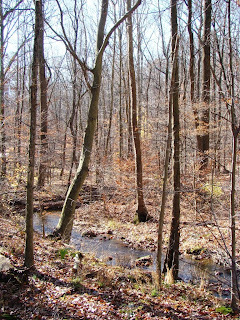 I traipsed around the woods a bit, enjoying the temperature and the open view the now bare trees present. 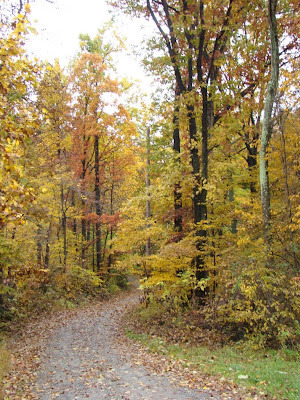 It’s much easier walking without underbrush and seasonal growth impeding my progress. 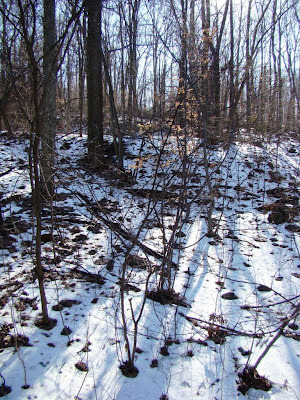 During the warm seasons, I can’t easily stray far off a trail because of it. This time of year I can walk wherever I want, and that’s more to my wandering style. 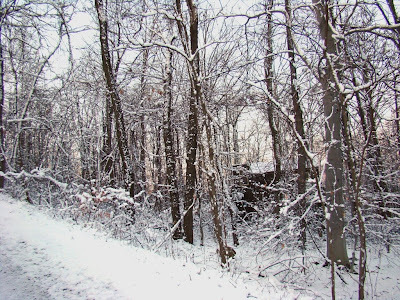 I set off into the woods, following no path, not even a deer trail. I walked where the ground was easiest, skirting around boulders, avoiding low spots or steep climbs. I just wandered wherever my feet took me. 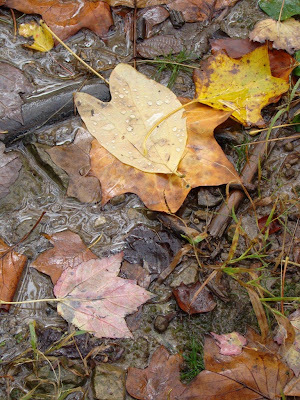 The leaves are deep and fluffy on the forest floor, as no rain has fallen since they fell. The leaves aren’t compressed at all, and my every step was crunchy and loud. I had no chance to sneak up on any woodland animal unannounced. I noticed that a few leaves still cling to the trees. I suspect they will soon become the marcescent leaves of this winter. The beech leaves in today’s photo will likely be among those that hang on. Oddly, at least to me, a same-sized beech tree about 25 feet from this one has dropped all its leaves. Both trees look much the same in height and girth. Both appear healthy. 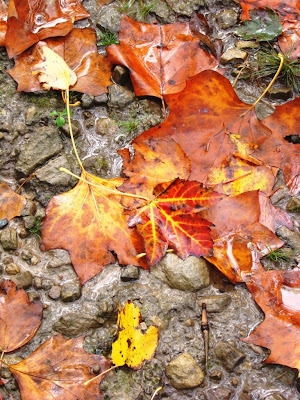 Yet one hangs on to its leaves and the other has dropped them. 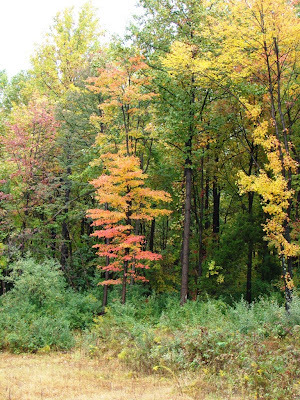 A few trees have leaves that haven’t yet turned color. Those are increasingly rare. Several small chestnut oaks huddled together in a tight group fall into that category. Is it because those leaves are so large? Birds didn’t mind the noise I made as I crunched through the forest. Dark-eyed juncos are here in numbers now. Later, when I was back at the cabin, I saw the first of them eying my bird feeders. The juncos have been here since mid-October, but until now they apparently found plenty of natural food and didn’t need to visit the feeders. They are still cautious, sitting above the feeders, watching the chickadees and titmice flit in and out before daring to dip down and feed themselves. The chickadees and titmice are working hard on the dessicated flowers of the tulip poplar trees. They flit from seed pod to pod so quickly that until I eyed them with binoculars, I suspected kinglets or gnatcatchers. Just being outside in the daylight is already a treat. The time change and having to work for a living makes my daylight forays a thing of the weekends only. Yesterday was a day lovely enough to get me through the week until I can be outside during the daylight again. If you’ve read yesterday’s blog post, you may remember I put a bit of a teaser in there about how several hundred feet of elevation change means that up here at the cabin I am seeing at least one bird species in my local patch that I’m apparently not supposed to be seeing. That species is black-capped chickadee, one of the more common species I see. The reason I know I’m not supposed to be seeing it is because E-Bird, Cornell Lab of Ornithology’s bird sightings site, considers it a "rare" species in my county and always asks me to confirm the sighting. E-Bird thinks I’m only supposed to be seeing Carolina chickadees. And if I lived down off the mountain, E-Bird would be right. 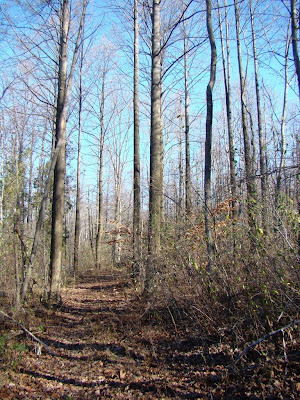 Ten years ago, I had to go in search of Carolina chickadees. Black-capped chickadees ruled the area. Carolina chickadees weren’t far to the south of me, though. Then a few years passed, and Carolina chickadees were reported at Pinchot park, just about three miles south of me. So I went to the bird blind where they were and waited what seemed like an awful amount of time, sorting through lots of black-capped chickadees until I finally found a pair of the Carolina chickadees. Then a few years ago, I saw the first Carolina chickadees at the cabin. The Carolinas were much in the minority at my feeders, but occasionally, perhaps once or twice a week, I’d see the little, grayer birds and added them to my yard list. Last year, I was even lucky enough to get a photo of the two species side by side. This year at my feeders Carolina chickadees are more in evidence, if not quite even with the black-capped chickadees. And, I’m seeing birds that I believe are intergrades of the two. It’s starting to make me wonder how they can be called two different species, but that’s a discussion for a different day. Anyway, research shows that Carolina chickadees are moving further north, but also suggests that where the two more or less overlap black-capped chickadees do better at higher altitudes. So here up on Roundtop, the black-capped chickadee is still a common sight, but given the spread of the Carolina chickadees, I wonder how much longer that will remain true. Last night the air was still and calm, and this morning I had a bit of a frost. It still wasn’t a freeze, and by my cabin thermometer, the temperature never actually reached 32. That could be misleading, though. I took today’s photo just 50 yards or so down the hill from the cabin, and the temperature apparently did dip to 32 near the ground down there. Dewpoints are usually chillier near the ground than a few feet above it. On still nights like last night, that chillier air isn’t moved around by a breeze, and so low-lying little pockets of air can be colder than the surrounding areas. The temperature at the cabin is also different from what is found down off the mountain. The temperature here is often several degrees cooler than what people in the suburbs report. It’s cooler in summer, and it’s cooler in winter. I can routinely figure on 3-5 degrees, sometimes it’s as much as 7 degrees. When you have mountains, air pressure is lower as you go higher. The difference in temperature is usually about 5.4 degrees per 1000 feet. As the altitude difference between suburbia and my cabin is only about 700 feet, the temperature difference between there and here should be around 3.5 degrees cooler at the cabin. But that’s not the whole story. I also don’t have roofs and macadam and street lights around me. Those things can and do raise nearby temperatures. So the 3.5 degree difference in 700 feet should be true if you’re measuring, say, a forest at 300 feet above sea level to a forest at 1000 feet above. 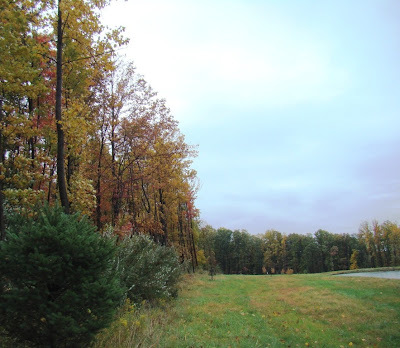 When one area is a forest and the other is urbanized, the temperature differences are more pronounced. That slight temperature difference apparently also accounts for why at least one of the bird species I routinely see at the cabin is different than what people living in similar habitats off the mountain see. But I'll have more on that tomorrow. Even though I’ve been on this planet for more than half a century now, I’m still surprised at how what happens outside my door every year seems new again when a new season arrives. Last night I was noticing how quickly it gets dark after the sun sets. Twilight seems shorter these days. Once the sun drops behind Nell’s Hill, darkness arrives soon after. This time of year no long twilights allow me to be outside in some degree of brightness for an hour after the sun sets. The sun dips behind the mountain and within 10-15 minutes, it is dark. Last evening I was standing out in the darkening forest, and the night was approaching almost at the point where I needed my headlamp. Then I looked up. 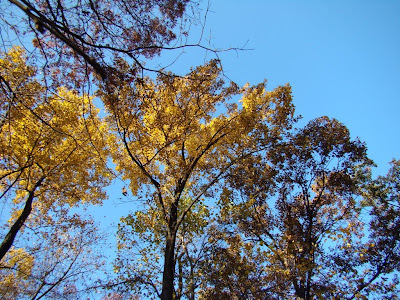 There at the tops of the tall oaks that surround my cabin, sunlight still touched the last of leaves that still cling to the trees. The tallest of the oaks here are white oaks, which can grow to 100 feet. 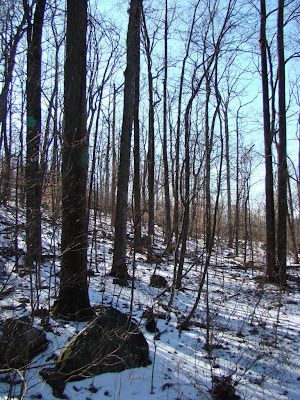 As best I can determine, the oaks in my forest are middle-aged and so are in the 100-125 year old range, which should put them pretty close to 100 feet tall. What surprised me is that the sunlight that still touched the treetops didn’t extend further down to brighten the woods, at least a little, onto the ground where I stood. But it didn’t. Up there, the leaves get more sunlight, so I guess it shouldn’t be a surprise to see why leaves remain longer on the tallest trees in the forest. But if I knew that or had made that connection in previous years, I’d forgotten it, and seeing the evidence of that last evening made the connection real again. Each season that I live holds its own treasures of forgetting and remembering. I’m often surprised by the forgetting. I don’t think my memory is any worse than anyone else’s, but until I experience the differences each season brings anew, those older memories aren’t at the top of my consciousness. It takes the actual experience of the new season to pull them back to me again. Today, fall is new again. 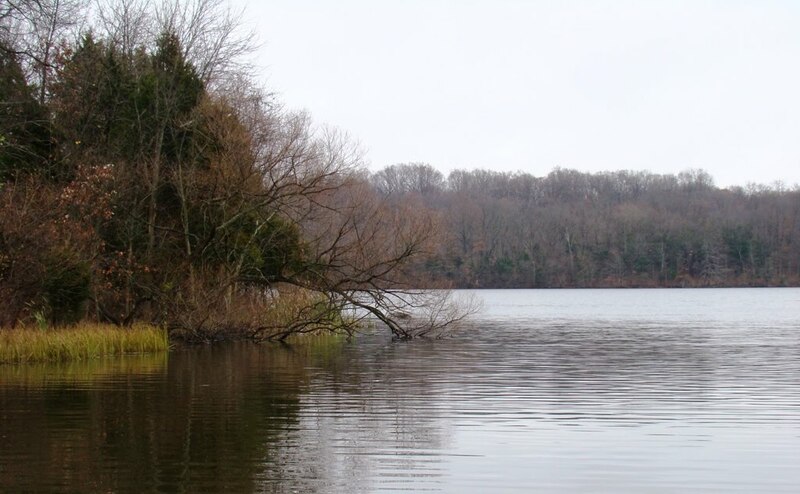 On Sunday, I made a quick trip to nearby Pinchot State Park to look for winter waterfowl. 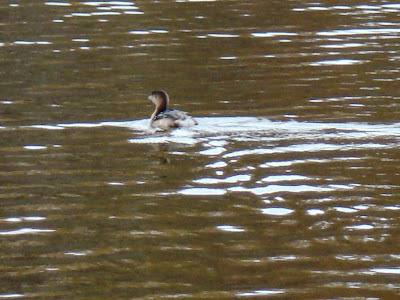 So that explains why I’m foisting a bad photo of a pied-billed grebe in winter plumage upon readers. In addition to this little grebe, I also found a small flock of buffleheads and ring-necked ducks, but I didn’t find anything else other than the usual mallards and Canada geese. Over the past 10-15 years or so, numbers of waterfowl have declined, in some areas precipitously. The worst decline is in Asia, where 62% of species show declines, but even in North America, 37% of species have declined. Loss of wetland breeding habitat is the main reason, though for some species over-harvesting is also a factor. Certain species are also more affected than others—brant, American black duck and scaup (both greater and lesser but especially greater) are among the hardest hit. The black duck was once the most abundant freshwater species but is now increasingly uncommon. Droughts in the past few years have also taken a toll on breeding success, even where wetlands remain. The situation in the U.S. isn’t completely dire. 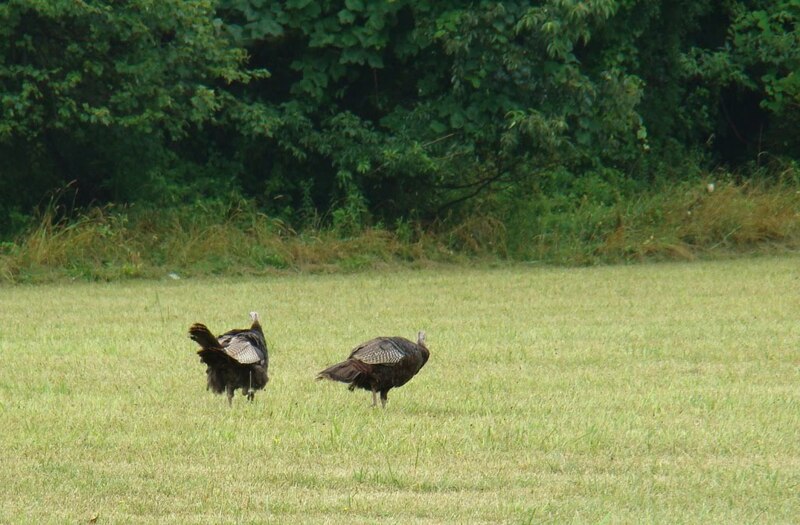 A couple of good breeding seasons can go a long way towards improving a population. Waterfowl tend to have large clutches, so in a good year a successful pair can fledge as many as 8-10 young. Estimates for 2009 indicate this past breeding season was a good one, certainly better than 2008. The USFWS publishes a status report on waterfowl populations every year and in the current report found that green-winged teal are at an all-time high and blue-winged teal are at their second highest numbers. Redheads are also on the plus side. Even canvasback, a species that has declined especially in the east, are about 35% above the 2008 estimate. Scaup remains some 20% below the long-term average but is doing better than last year. American wigeon, northern pintail, scoters and scaup are all still well below the long-term (54 years) averages. To read the entire 79-page Waterfowl Population Status, 2009, click here. You’ll find a lot of interesting reading in there. I'm glad the news is better this year, but that didn't translate into lots of waterfowl sightings for me this past weekend. Maybe the upcoming week will be better. Most of the season’s leaves are on the ground now. I am mid-shin deep in them at the moment. After rain on Friday night, by Saturday morning a great deal more leaves had fallen, leaving perhaps no more than 20-30% still attached. Then on Saturday evening, just before sunset, a big wind blew up for a minute or so. 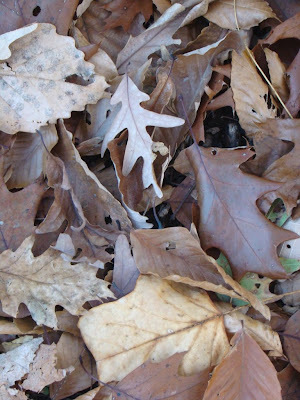 The forest was a blizzard of leaves, and when the wind died down again, most of the rest of the leaves were down too. For the first time in nearly six months, I can see Nell’s Hill again from my back deck. The air truly feels like fall, now. Yesterday afternoon I was outside wearing a light sweater, brooming the leaves off my front deck and feeling perfectly comfortable, though my nose was cold. That’s how I know it’s fall. When my nose is cold and the rest of me isn’t. Last night, as a result of having no leaves on the trees and a nearly full moon in the sky, I had trouble staying asleep. It just seemed too light outside. I could, of course, close my curtains, but what’s the point of having a picture window in the bedroom to look out into the forest, if I close the curtains? I will get used to the lighter nights of fall and winter in a day or so. Today, the change is still novel and perhaps more sudden than usual. It’s a bit out of the ordinary to go from half the leaves down to almost all down in just a day or so. 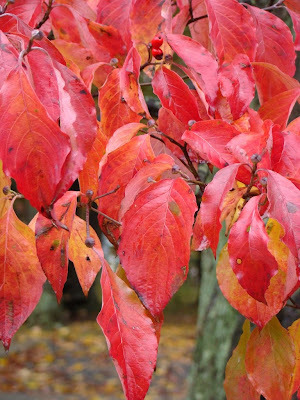 And last weekend, the fall color was just at its peak. So today is November 2 and the vast majority of the leaves are on the ground. The time of the fall is utterly normal. Of course, if that big wind hadn’t come through Saturday evening, many would still be hanging on, and I’d likely be fretting that the leaf fall was late. Once the color peaks, leaf fall isn’t far behind, but sometimes it needs a little help from a north wind to push them along.